Double Deck. 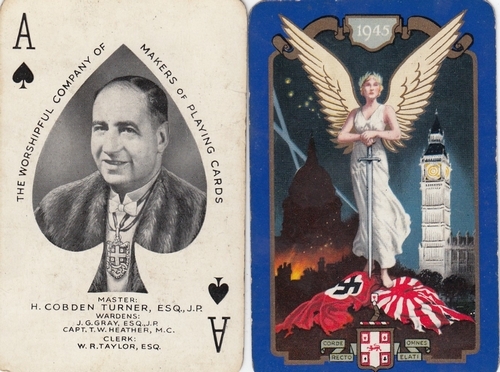 The Worshipful Company of Makers of Playing Cards (WCMP) 1945 Commemorating Peace. Winged Goddess stands triumphant on flags of Germany and Japan. Background shows St Paul's Cathedral and Big Ben. Portrait on Ace of Spades of the Master H Cobden Turner ESQ J.R,. Complete double pack Blue in mint condition red used deck in very good condition in original box. 53 cards including Jokers. 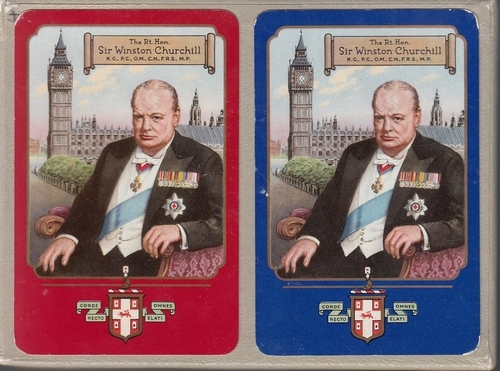 These limited edition cards were presented to guests attending the Livery Dinner in October 1946. They are normally presented at the Annual Investiture of the new Master each year and are not otherwise commercially available. Single Deck. 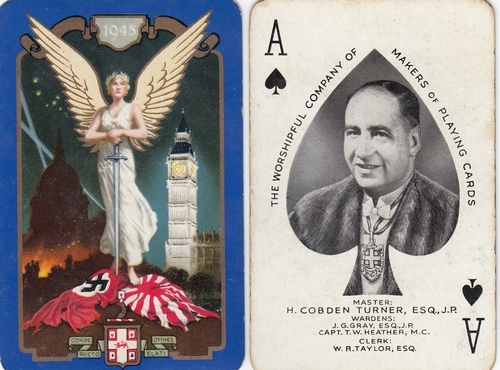 The Worshipful Company of Makers of Playing Cards (WCMP) 1945 Commemorating Peace. Winged Goddess stands triumphant on flags of Germany and Japan. Background shows St Paul's Cathedral and Big Ben. Portrait on Ace of Spades of the Master H Cobden Turner ESQ J.R,. Ccomplete single pack lacks . Used in good condition in made up box. 52 cards.+ Joker. Single Deck in original double box. 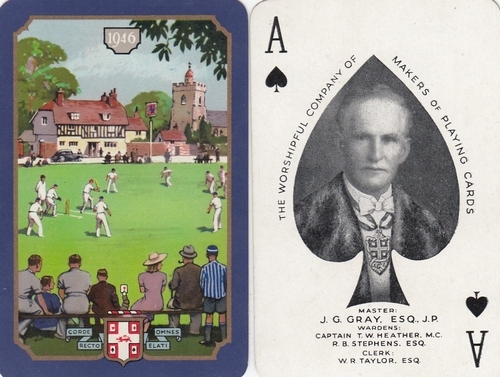 The Worshipful Company of Makers of Playing Cards (WCMP) 1946 Commemorating the End of the War and peace time with Cricket Scene. Portrait on Ace of Spades of the Master. Complete single pack in excellent condition in original leather double box. 54 cards including 1 Jokers. These limited edition cards are presented to guests attending the Annual Investiture of the new Master each year and are not otherwise commercially available. Double Deck Sealed. 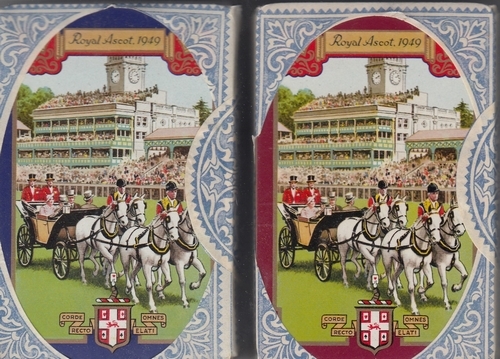 Royalty The Worshipful Company of Makers of Playing Cards (WCMP) 1949 Commemorating the Royal Ascot event. 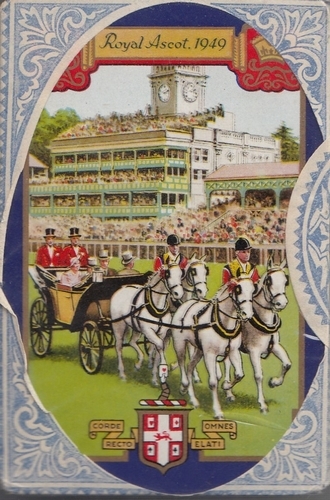 Depicts the King and Queen driving along the course on the opening day in an open carriage. Portrait on Ace of Spades of the Master. Mint sealed maroon and blue borders. Each pack complete in original damaged double box. Mint Sealed Single Deck. 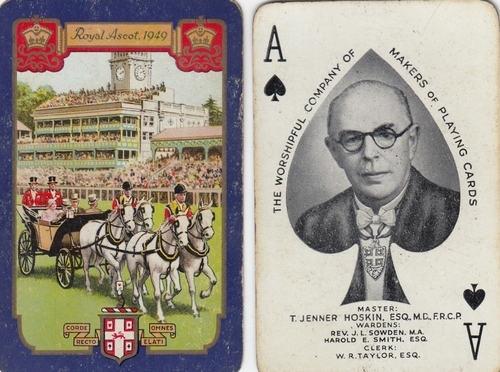 The Worshipful Company of Makers of Playing Cards (WCMP) 1949 Commemorating the Royal Ascot event. Portrait on Ace of Spades of the Master. Asnew sealed mint condition 54 cards lacks box. Double Deck Sealed. 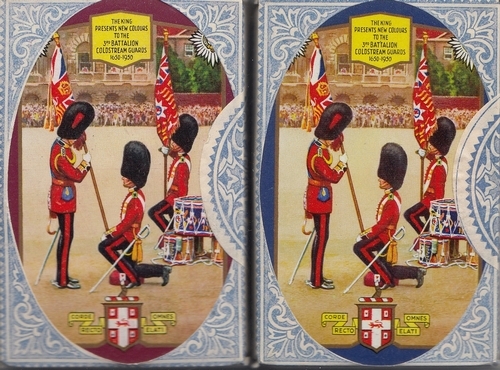 Royalty The Worshipful Company of Makers of Playing Cards (WCMP) 1950 Presentation by the King of the new Colours to the 3rd Battalion Coldstream Guards on Horse Guards Parade in London. Portrait on Ace of Spades of the Master. Mint sealed maroon and blue borders. Each pack complete in original damaged double box. Mint Sealed Single Deck. 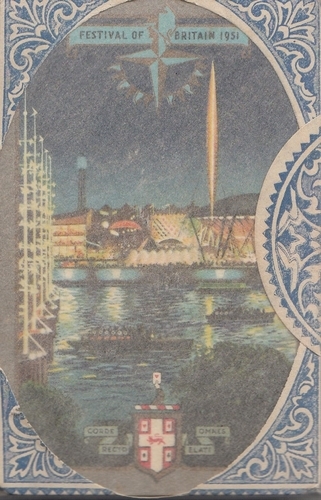 The Worshipful Company of Makers of Playing Cards (WCMP) 1951 Commemorating The The Festival of Britain. Portrait on Ace of Spades of the Master. Complete single pack in original wrapper. 54 cards including 2 Jokers. These limited edition cards are presented to guests attending the Annual Investiture of the new Master each year and are not otherwise commercially available. Single Deck. 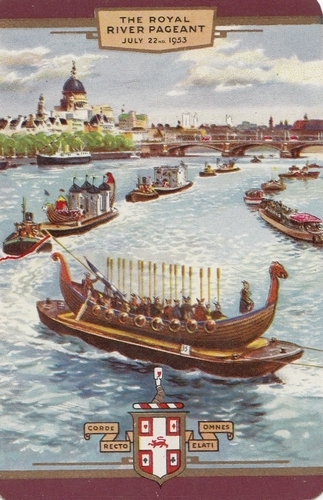 The Worshipful Company of Makers of Playing Cards (WCMP) 1953 Commemorating the Royal River Pageant July 22nd 1953 (Coronation Year of Queen Elizabeth II). Portrait on Ace of Spades of the Master. Norman V Watson Esq. Used condition in original leather single box. 53 cards including Joker. Mint Double Deck. 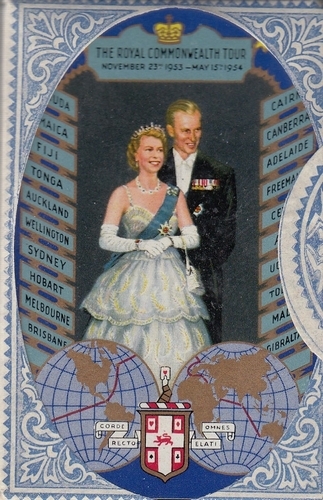 The Worshipful Company of Makers of Playing Cards (WCMP) 1954Royal Commonwealth Tour . Portrait on Ace of Spades of the Master. Complete double pack sealed in original tax wrappers in mint condition in original Company leather box. 54 cards including 2 Jokers. These limited edition cards are presented to guests attending the Annual Investiture of the new Master each year and are not otherwise commercially available. Mint Sealed Single Deck. 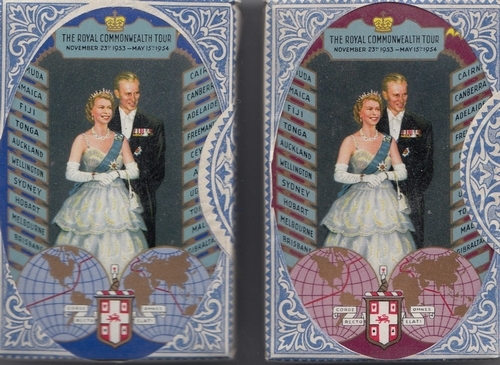 The Worshipful Company of Makers of Playing Cards (WCMP) 1954 Royal Commonwealth Tour . Portrait on Ace of Spades of the Master. Complete single pack sealed in original tax wrappers in mint condition in original Company leather box. 54 cards including 2 Jokers. These limited edition cards are presented to guests attending the Annual Investiture of the new Master each year and are not otherwise commercially available. Double Deck. 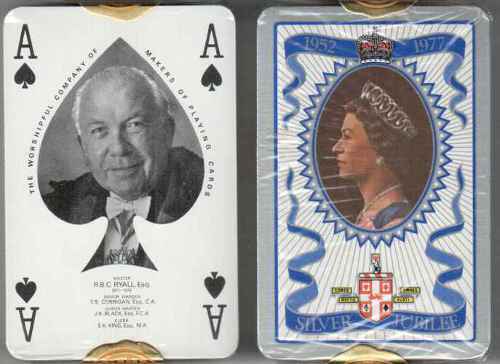 The Worshipful Company of Makers of Playing Cards (WCMP) 1955 The Rt Hon Sir Winston Churchill Portrait on Ace of Spades of the Master. Complete used double pack in original Company leather box. 54 cards including 2 Jokers. These limited edition cards are presented to guests attending the Annual Investiture of the new Master each year and are not otherwise commercially available. Mint Double Deck. 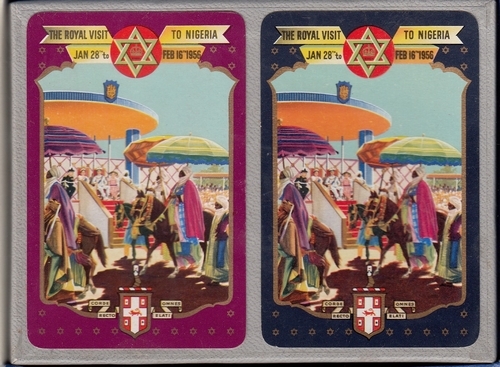 The Worshipful Company of Makers of Playing Cards (WCMP) 1956 Commemorating the Royal Visit to Nigeria. Portrait on Ace of Spades of the Master. Complete double pack sealed in original tax wrappers in mint condition in original Company damaged and soiled leather box. 54 cards including 2 Jokers. These limited edition cards are presented to guests attending the Annual Investiture of the new Master each year and are not otherwise commercially available. Double Deck. 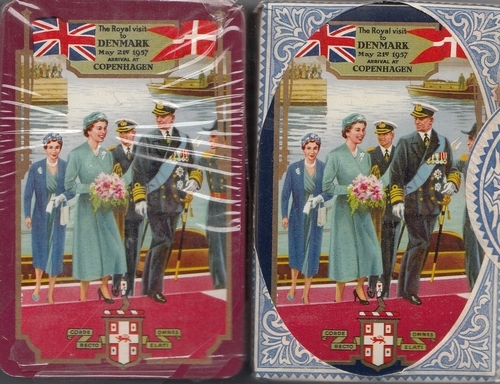 The Worshipful Company of Makers of Playing Cards (WCMP) 1957 Commemorating the Royal visit to Denmark on 21 May. Showing the arrival at Copenhagen of H.M. Queen Elizabeth II and H. R. H. Duke of Edinburgh. Portrait on Ace of Spades of the Master V H C Amberg. Complete double pack mint condition in original Company lbox. 54 cards including 2 Jokers. These limited edition cards are presented to guests attending the Annual Investiture of the new Master each year and are not otherwise commercially available. Note: Outer box only, maybe marked, soiled or lightly damaged. Mint Single Deck. 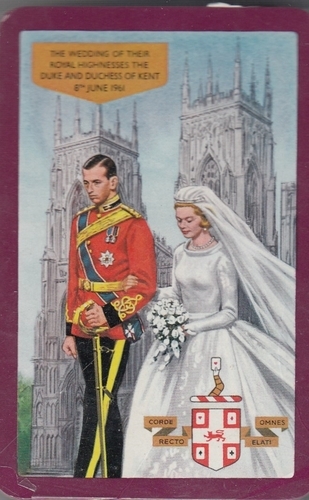 The Worshipful Company of Makers of Playing Cards (WCMP) 1961 Commemorating the The Wedding of Their R.H. The Duke and Duchess of Kent. Portrait on Ace of Spades of the Master. Complete double pack in mint condition in original Company plastic box and outer box. Sealed. 54 cards including 2 Jokers. These limited edition cards are presented to guests attending the Annual Investiture of the new Master each year and are not otherwise commercially available. Single Deck. 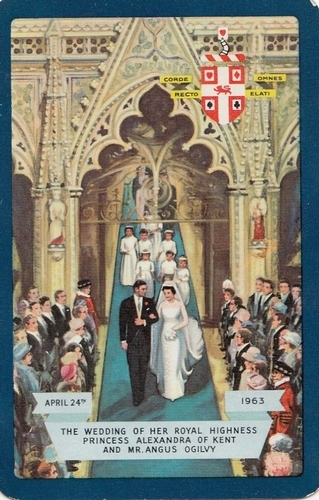 The Worshipful Company of Makers of Playing Cards (WCMP) 1963 Commemorating the The Wedding of Her Royal Highness Princess Alexandra of Kent & Mr. Angus Ogilvy. Portrait on Ace of Spades of the Master . Very good clean condition in plastic box. 54 cards including 2 Jokers. 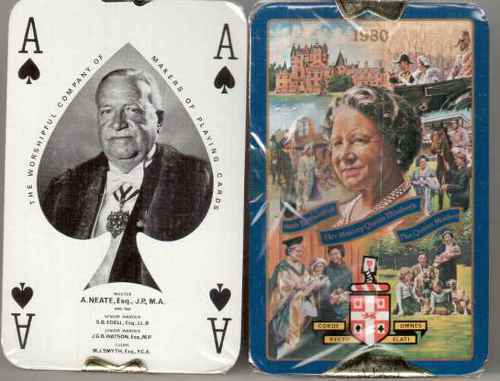 Mint double Deck.The Worshipful Company of Makers of Playing Cards (WCMP) 1964. Commemorating Shakespeare Quatercentenary 1564-1964 Portrait on Ace of Spades of the Master. Complete single pack in excellent condition in plastic box and outer box. Sealed. 54 cards including 2 Jokers. Mint Double Deck. 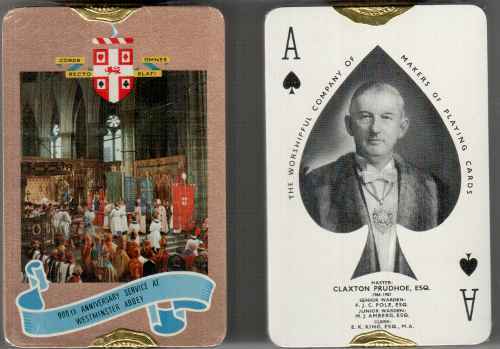 The Worshipful Company of Makers of Playing Cards (WCMP) 1966 Commemorating the 900th Anniversary of the Abbey showing the Service in progress. Portrait on Ace of Spades of the Master Claxton Prudoe. Complete double sealed pack in perfect condition original plastic band outer box. 54 cards including 2 Jokers. These limited edition cards are presented to guests attending the Annual Investiture of the new Master each year and are not otherwise commercially available. Mint Double Deck. 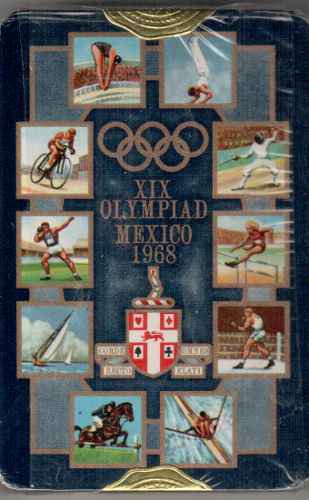 The Worshipful Company of Makers of Playing Cards (WCMP) 1968 Commemorating the XIX Olympiad Mexico. Portrait on Ace of Spades of the Master M.J. Amberg, Esq. Complete double pack in mint condition in original Company plastic box and outer box. 54 cards including 2 Jokers. These limited edition cards are presented to guests attending the Annual Investiture of the new Master each year and are not otherwise commercially available. Single Deck. 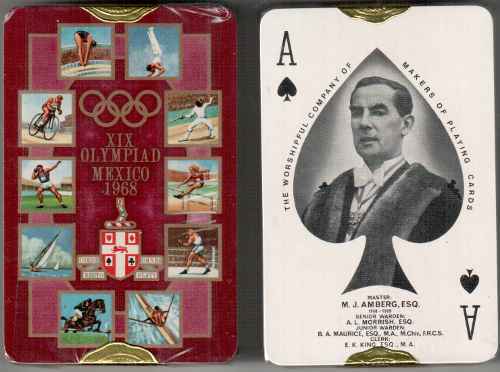 The Worshipful Company of Makers of Playing Cards (WCMP) 1968 Commemorating the XIX Olympiad Mexico. Portrait on Ace of Spades of the Master M.J. Amberg, Esq. Complete sealed single BLUE pack in mint condition in original Company plastic double box. 54 cards including 2 Jokers. .
Mint Sealed Double Deck. 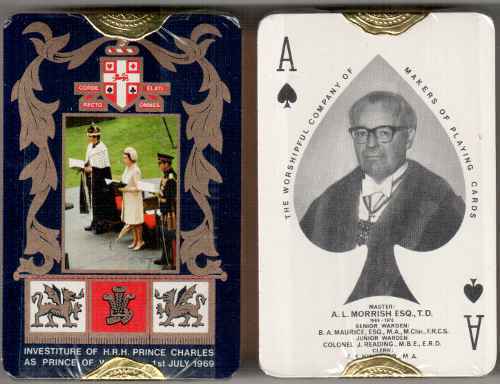 The Worshipful Company of Makers of Playing Cards (WCMP) 1969 Commemorating the Investiture of H.R.H. Prince Charles as Prince of Wales. Portrait on Ace of Spades of the Master A.L. Morrish Esq., T.D. Complete double pack in mint condition in original Company plastic box and outer box. 54 cards including 2 Jokers. These limited edition cards are presented to guests attending the Annual Investiture of the new Master each year and are not otherwise commercially available. Mint Sealed Single Deck. 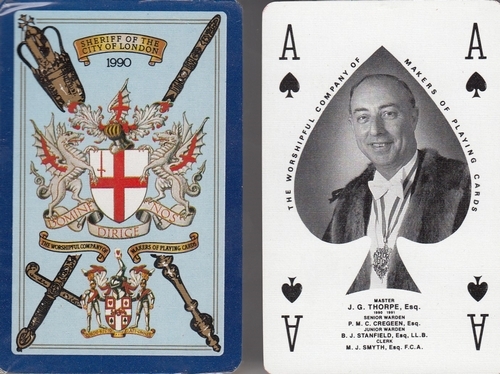 The Worshipful Company of Makers of Playing Cards (WCMP) 1969 Commemorating the Investiture of H.R.H. Prince Charles as Prince of Wales. Portrait on Ace of Spades of the Master A.L. Morrish Esq., T.D. Complete single RED reverse pack in mint condition in original Company plastic box. 54 cards including 2 Jokers. These limited edition cards are presented to guests attending the Annual Investiture of the new Master each year and are not otherwise commercially available. NOTE: Image is generic and NOT neccessarily the actual pack being offered. Mint Double Deck. The Worshipful Company of Makers of Playing Cards (WCMP) 1970 Commemorating the Sailing of the Mayflower in 1620, when Pilgrim Fathers left Plymouth and crossed the Atlantic to found a Puritan Settlement in America. Portrait on Ace of Spades of the Master B A Maurice. Complete double pack in perfect condition in original Company plastic box and outer box. 54 cards including 2 Jokers. These limited edition cards are presented to guests attending the Annual Investiture of the new Master each year and are not otherwise commercially available. Mint Sealed Single Deck. 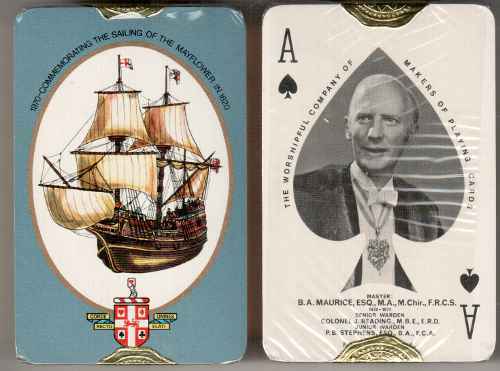 The Worshipful Company of Makers of Playing Cards (WCMP) 1970 Commemorating the Sailing of the Mayflower in 1620, when Pilgrim Fathers left Plymouth and crossed the Atlantic to found a Puritan Settlement in America. Portrait on Ace of Spades of the Master B A Maurice. Complete single pack in perfect condition. 54 cards including 2 Jokers. These limited edition cards are presented to guests attending the Annual Investiture of the new Master each year and are not otherwise commercially available. Mint Double Deck. 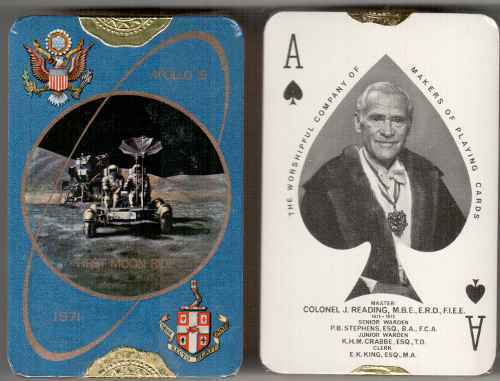 The Worshipful Company of Makers of Playing Cards (WCMP) 1971 Commemorating the First Moon Ride. Portrait on Ace of Spades of the Master Colonel J. Reading, M.B.E., E.R.D., F.I.E.E. Complete double pack in mint condition in original Company plastic box and outer box. 54 cards including 2 Jokers. These limited edition cards are presented to guests attending the Annual Investiture of the new Master each year and are not otherwise commercially available. Mint Sealed Double Deck. 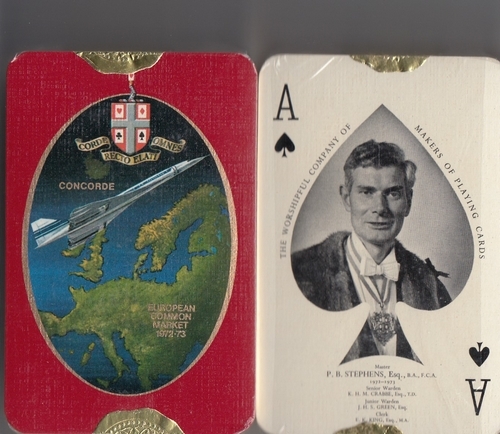 The Worshipful Company of Makers of Playing Cards (WCMP) 1972 Commemorating the European Common Market. Portrait on Ace of Spades of the Master P.B. Stephens, Esq., B.A., F.C.A. Complete double pack in mint condition in original Company plastic box and outer box. 54 cards including 2 Jokers. These limited edition cards are presented to guests attending the Annual Investiture of the new Master each year and are not otherwise commercially available. Mint Double Deck. 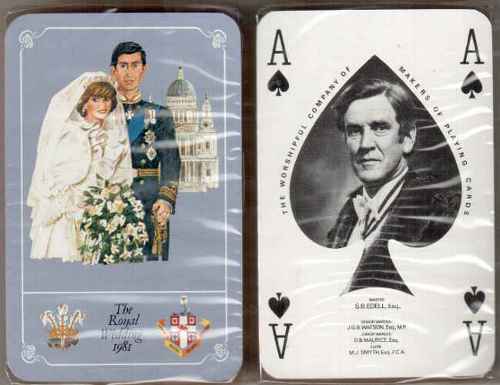 The Worshipful Company of Makers of Playing Cards (WCMP) 1973 Commemorating the wedding of H.R.H. Princess Anne and Captain Mark Phillips on 14 November. Design suitably inscribed 'H.R.H. The Princess Anne show-jumping' with gold border and second pack 'Captain Mark Phillips, The Queen's Dragoon Guards, show-jumping' with silver border. Cards were presented to H.R.H. Princess Anne and Captain Mark Phillips. Portrait on Ace of Spades of the Master K H M Crabbe. Complete double pack in perfect condition in original Company plastic box and outer box. 54 cards including 2 Jokers. These limited edition cards are presented to guests attending the Annual Investiture of the new Master each year and are not otherwise commercially available. Mint Single Deck. 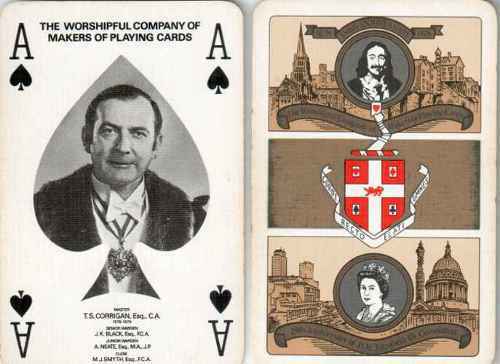 The Worshipful Company of Makers of Playing Cards (WCMP) 1973 Commemorating the wedding of H.R.H. Princess Anne and Captain Mark Phillips on 14 November. 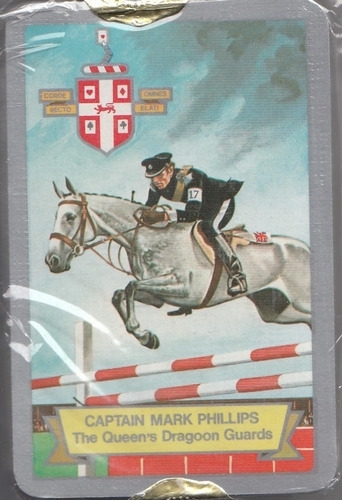 Single pack 'Captain Mark Phillips, The Queen's Dragoon Guards, show-jumping' with silver border. Portrait on Ace of Spades of the Master K H M Crabbe. Complete single pack in perfect condition in plastic box. 54 cards including 2 Jokers. These limited edition cards are presented to guests attending the Annual Investiture of the new Master each year and are not otherwise commercially available. Mint Single Deck. 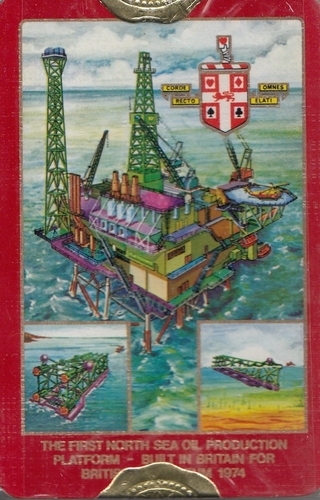 The Worshipful Company of Makers of Playing Cards (WCMP) 1974 Commemorating the First North Sea Production Platform, built in Britain for the British Petroleum Co. Limited. Portrait on Ace of Spades of the Master J H S Green. Complete single red pack in perfect condition in plastic box. 54 cards including 2 Jokers. These limited edition cards are presented to guests attending the Annual Investiture of the new Master each year and are not otherwise commercially available. Mint Double Deck. 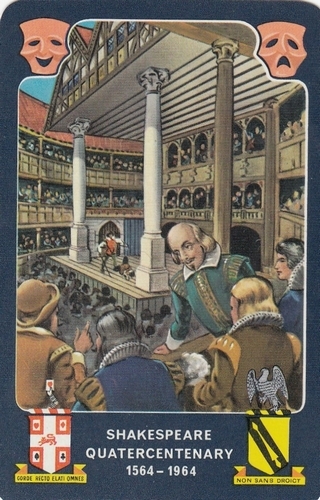 The Worshipful Company of Makers of Playing Cards (WCMP) 1976 Commemorating William Caxton the first printer whose Press was established in Westminster 500 years earlier in 1476. Portrait on Ace of Spades of the Master David Hill. Complete sealed double pack in perfect condition original plastic and outer box. 54 cards including 2 Jokers. These limited numbers of cards are presented to guests attending the Annual Investiture of the new Master each year and are not commercially available. Mint Double Deck. 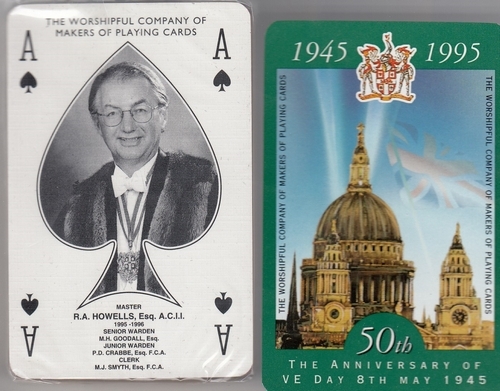 The Worshipful Company of Makers of Playing Cards (WCMP) 1977 Commemorating the Silver Jubilee 1952-1977. The twenty-fifth anniversary of the Accession of H.M. Queen Elizabeth II. Portrait on Ace of Spades of the Master R B C Ryall. Complete double pack in perfect condition in original Company plastic box. 54 cards including 2 Jokers. These limited edition cards are presented to guests attending the Annual Investiture of the new Master each year and are not otherwise commercially available. Mint Double Deck. 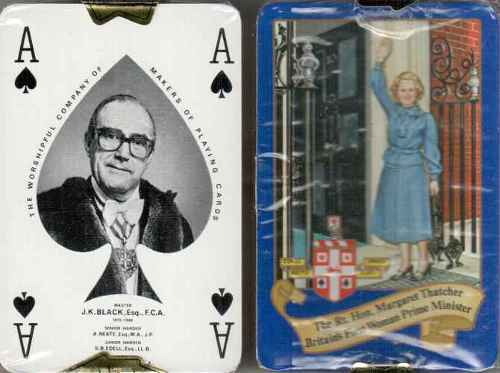 The Worshipful Company of Makers of Playing Cards (WCMP) 1978 Commemorating the 25th Anniversary of H.M. Elizabeth 11th Coronation. Portrait on Ace of Spades of the Master T.S. Corringan, Esq., C.A. Complete double pack in excellent condition in original Company plastic box and outer box. 54 cards including 2 Jokers. These limited edition cards are presented to guests attending the Annual Investiture of the new Master each year and are not otherwise commercially available. Mint Double Deck. 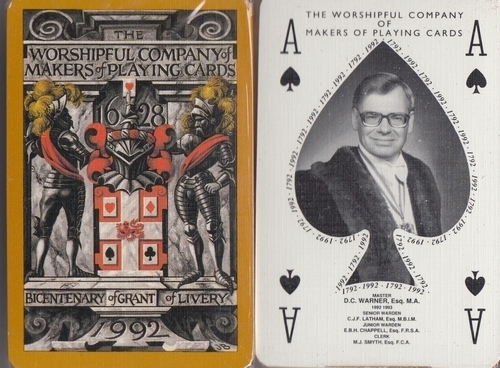 The Worshipful Company of Makers of Playing Cards (WCMP) 1979 Commemorating the The Rt. Hon. Margaret Thatcher Britain's First Women Prime Minister. Portrait on Ace of Spades of the Master J.K. Black, Esq., F.C.A. Complete double pack in mint condition in original Company plastic box and outer box. 54 cards including 2 Jokers. These limited edition cards are presented to guests attending the Annual Investiture of the new Master each year and are not otherwise commercially available. Mint Double Deck. 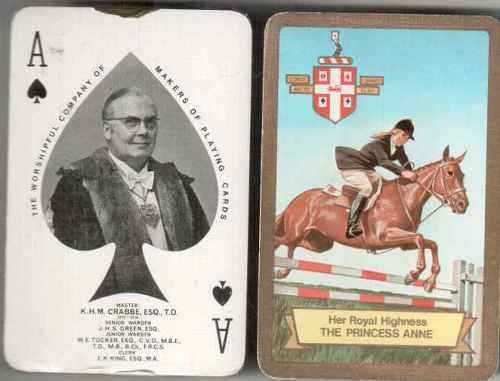 The Worshipful Company of Makers of Playing Cards (WCMP) 1980 Commemorating the 80th Birthday of H.M Queen Elizabeth The Queen Mother. Portrait on Ace of Spades of the Master A. Neate, Esq, J.P., M.A. Complete double pack in mint condition in original Company plastic box and outer box. 54 cards including 2 Jokers. These limited edition cards are presented to guests attending the Annual Investiture of the new Master each year and are not otherwise commercially available. Mint Double Deck. 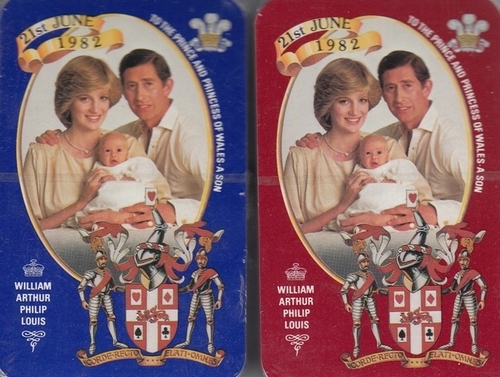 The Worshipful Company of Makers of Playing Cards (WCMP) 1981 Commemorating the The Royal Wedding 1981. Portrait on Ace of Spades of the Master S.B. Edell, Esq. Complete double pack in mint condition in original Company plastic box and outer box. 54 cards including 2 Jokers. These limited edition cards are presented to guests attending the Annual Investiture of the new Master each year and are not otherwise commercially available. Mint Double Deck. 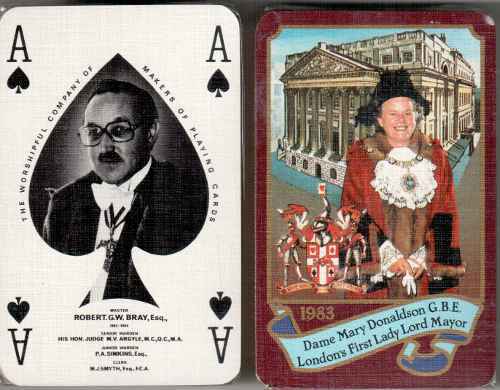 The Worshipful Company of Makers of Playing Cards (WCMP) 1983 Commemorating the Dame Mary Donaldson G.B.E. London's First Lady Lord Mayor. Portrait on Ace of Spades of the Master Robert. G.W. Bray, Esq. Complete double pack in mint condition in original Company plastic box and outer box. 54 cards including 2 Jokers. These limited edition cards are presented to guests attending the Annual Investiture of the new Master each year and are not otherwise commercially available. Mint Double Deck. 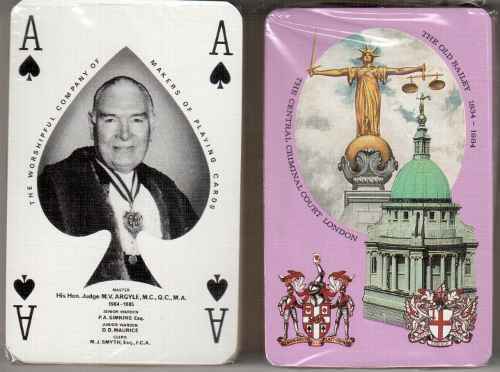 The Worshipful Company of Makers of Playing Cards (WCMP) The Old Bailey 1834-1984 150th Anniversary of The Central Criminal Court London. Portrait on Ace of Spades of the Master the often controversial late Judge M V Argyle MC, QC, MA. Complete re-sealed double pack in perfect mint condition original plastic and outer box. 54 cards including 2 Jokers. These limited edition cards are presented to guests attending the Annual Investiture of the new Master each year and are not otherwise commercially available. Mint Double Deck. 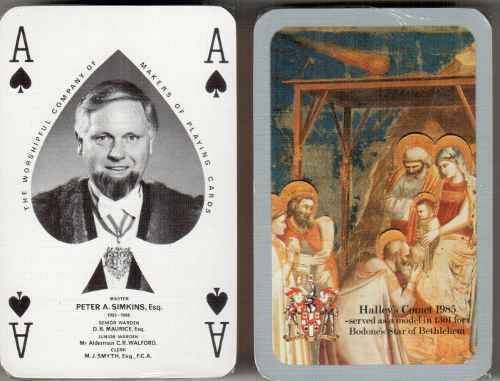 The Worshipful Company of Makers of Playing Cards (WCMP) 1985 Commemorating Halley's Comet. Design inscribed 'served as a model in 1301 for Bodone's Star of Bethlehem'. (Fresco: Arena Chapel, Padua, by Giotto.) Portrait on Ace of Spades of the Master Peter A Simkins. Complete double pack in mint condition in original Company plastic box and outer box . 54 cards including 2 Jokers. These limited edition cards are presented to guests attending the Annual Investiture of the new Master each year and are not otherwise commercially available. Australian Bicentenary 1788 - 1988. Showing a portrait of Captain James Cook and the Flag of Australia. Portrait on Ace of Spades of the Master Basil G Rigg. Complete double pack in perfect condition in original Company plastic box and outer box. 54 cards including 2 Jokers and leaflet. These limited edition cards are presented to guests attending the Annual Investiture of the new Master each year and are not otherwise commercially available. Mint Double Deck. 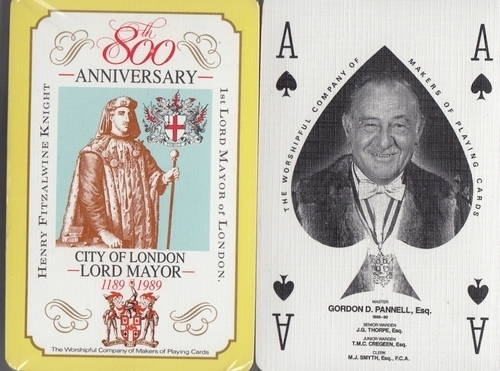 The Worshipful Company of Makers of Playing Cards (WCMP) 1989 Commemorating the 800th Anniversary 1189-1989 City of London Lord Mayor, showing a portrait of the 1st Lord Mayor of London, Henry Fitzalwine Knight. Portrait on Ace of Spades of the Master Gordon D Panell. Complete double pack in perfect condition in original Company plastic box. 54 cards including 2 Jokers and leaflet. These limited edition cards are presented to guests attending the Annual Investiture of the new Master each year and are not otherwise commercially available. 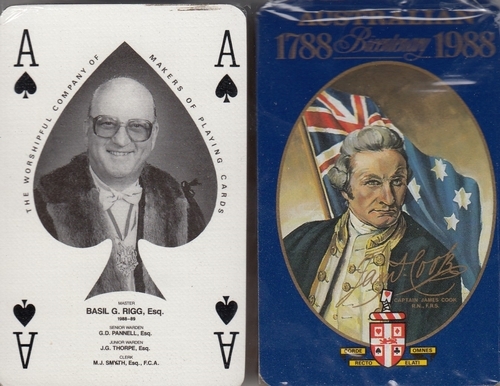 Mint Double Deck.The Worshipful Company of Makers of Playing Cards (WCMP) 1990 Commemorating the Election as Sheriff of the City of London of Christopher Walford the first member of the Livery to gain this high distinction. Portrait on Ace of Spades of the Master John Thorpe. Complete double pack in mint condition in original plastic and outer box. 54 cards including 2 Jokers These limited edition cards are presented to guests attending the Annual Investiture of the new Master each year and are not otherwise commercially available. Mint Double Deck. 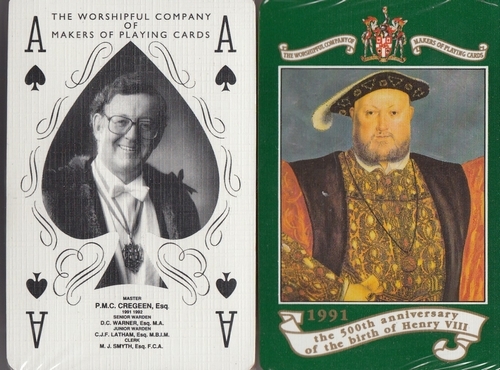 The Worshipful Company of Makers of Playing Cards (WCMP) 1991 Commemorating the 500th Anniversary of the Birth of Henry VIII showing a portrait of the King after the painting by Holbein. Portrait on Ace of Spades of the Master P M C Cregeen. Complete double pack in perfect condition in original Company plastic box and outer box. 54 cards including 2 Jokers. These limited edition cards are presented to guests attending the Annual Investiture of the new Master each year and are not otherwise commercially available. Bicentenary of the Grant of Livery to the Company on 27 November 1792. Arms of the Company supported by men in armour and dated. Design by John Bainbridge at the College of Arms. Portrait on Ace of Spades of the Master D C Warner M A. Complete double pack in perfect condition in original plush box and outer sleeve. 54 cards including 2 Jokers and leaflet. These limited edition cards are presented to guests attending the Annual Investiture of the new Master each year and are not otherwise commercially available. Mint Sealed Double Deck. 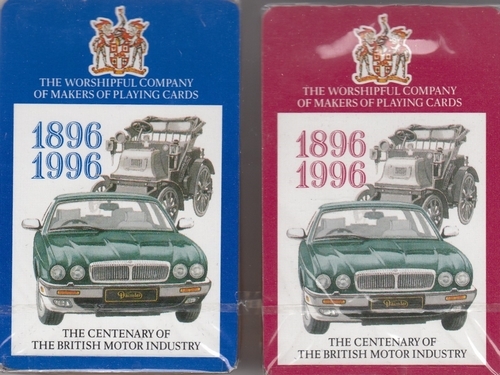 The Worshipful Company of Makers of Playing Cards (WCMP) 1996 Commemorating the The Centenary of The British Motor Industry 1896-1996. Portrait on Ace of Spades of the Master Michael H. Goodall Esq. Complete double pack in mint condition in original Company leather box and outer sleeve.. 54 cards including 2 Jokers. These limited edition cards are presented to guests attending the Annual Investiture of the new Master each year and are not otherwise commercially available. Note: Outer box only, maybe marked, soiled or lightly damaged. Mint Double Deck. 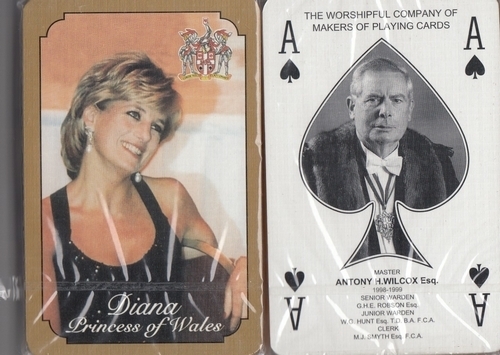 The Worshipful Company of Makers of Playing Cards (WCMP) 1998 Commemorating the Diana Princess of Wales. Portrait on Ace of Spades of the Master Antony H. Wilcox Esq. Complete double pack in mint condition in original Company leather box and sleeve. 54 cards including 2 Jokers. These limited edition cards are presented to guests attending the Annual Investiture of the new Master each year and are not otherwise commercially available. Mint Double Deck. 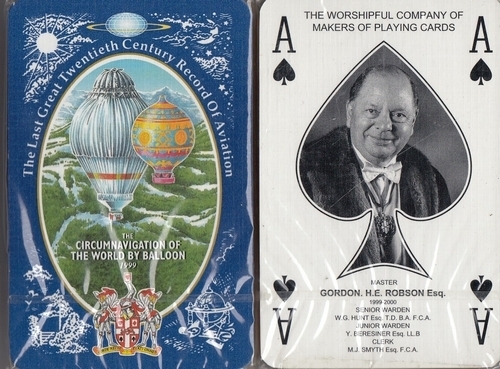 The Worshipful Company of Makers of Playing Cards (WCMP) 1999 Commemorating the Last Great Twentieth Century record of Aviation, The Circumnavigation of The World by Balloon. Portrait on Ace of Spades of the Master Gordon. H.E. Robson Esq. Complete double pack in mint condition in original Company leather box.. 54 cards including 2 Jokers. These limited edition cards are presented to guests attending the Annual Investiture of the new Master each year and are not otherwise commercially available. Mint Double Deck. 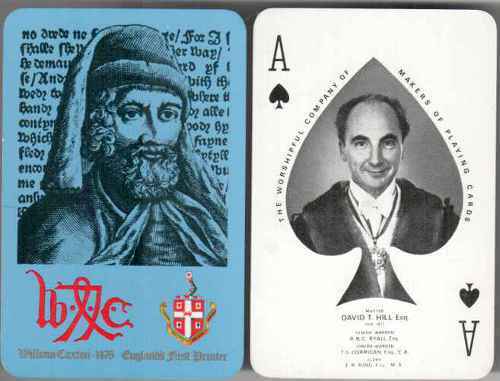 The Worshipful Company of Makers of Playing Cards (WCMP) 2001 Commemorating the 300th Anniversary of the Bevis Marks (Spanish-Portuguese) Synagogue. Portrait on Ace of Spades of the Master Yasha Beresiner LL.B. Complete double pack in perfect condition in original plush box and outer sleeve. 54 cards including 2 Jokers with explanatory leaflet. These limited edition cards are presented to guests attending the Annual Investiture of the new Master each year and are not otherwise commercially available. Mint Sealed Single Deckin original double box. 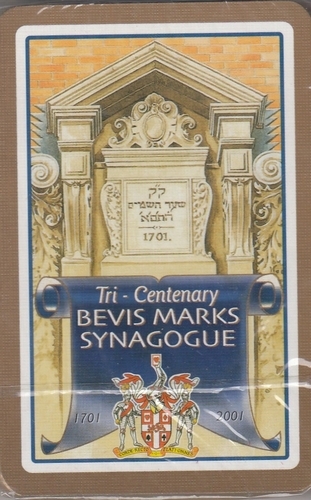 The Worshipful Company of Makers of Playing Cards (WCMP) 2001 Commemorating the 300th Anniversary of the Bevis Marks (Spanish-Portuguese) Synagogue. Portrait on Ace of Spades of the Master Yasha Beresiner LL.B. Complete single pack in perfect condition in original plush double box and outer sleeve. 54 cards including 2 Jokers with explanatory leaflet. These limited edition cards are presented to guests attending the Annual Investiture of the new Master each year and are not otherwise commercially available. Mint Double Deck. 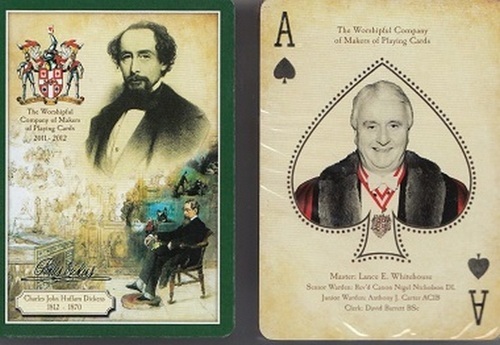 The Worshipful Company of Makers of Playing Cards (WCMP) 2011 commemorating the 200th Anniversary of the birth of Charles John Huffam Dickens 2011/12 Portrait on Ace of Spades of the Master Lance E Whitehouse. Complete double pack sealed in mint condition in original Company red leather box and outer sleeve.. 54 cards including 2 Jokers. These limited edition cards are presented to guests attending the Annual Investiture of the new Master each year and are not otherwise commercially available.